A fter thirteen years as an Upper West Side institution praised for its regional French fare and famed cheese service, Terrance Brennan’s Picholine, has been reinvented, showcasing a newly-inspired French menu with decidedly stronger Mediterranean influences and whimsically elegant decor. Located at 35 West 64th Street, Picholine (appropriately named after the petite green olives of the Mediterranean coast) is open for dinner seven nights a week, and Saturdays for lunch. Having revamped Picholine’s once mature space and formal French menu, Terrance Brennan plans to reposition himself as a power player in New York City’s competitive restaurant scene. Terrance Brennan began his cooking career at the age of thirteen, and has worked in many of Europe’s finest kitchens, including La Gavroche, Taillevent, and Le Tour d’Argent, before returning to America with an extensive knowledge of French cuisine. In 1993, he opened a restaurant of his own, Picholine, where he first introduced the European cheese course into the American dining experience. Picholine pioneered the concept of the cheese cart, quickly earning three stars from the New York Times, Zagat Survey’s Highest Overall Rating from 1997 through the present, and perennial awards for its 600-plus wine selections. Brennan went on to pay further homage to cheese service with Artisanal, a second, more casual French fromagerie/bistro. In the spring of 2003, he launched the Artisanal Cheese Center, exclusively devoted to the maturation and distribution of over 300 selected cheeses from all over the world. With a refurbished space and menu, Brennan has once again proven himself to be an evolved chef of the times with a contemporary menu that reads like a musical symphony of flavors, marrying notably sweet-and-savory elements to many of the offerings: foie gras with cherry compote & cocoa syrup; licorice-lacquered squab; duck breast with cherries & chocolate-peppercorn vinaigrette. While Picholine mainstays like olive-crusted saddle of lamb and a luscious sea urchin panna cotta remain signatures on the inventively updated menu, it also reflects modern Mediterranean sensibilities, with Italian (sheep’s milk ricotta gnocchi) and Spanish influences (paella spring rolls). Brennan and his chef de cuisine, Australian-born, Craig Hopson, also embrace classic American desserts, with sophisticated spins on peanut butter & jelly and the fig “Newton”, a modern rendition featuring milk sorbet and port coulis. Newly outfitted in a serene lilac, cream and gray color scheme, Picholine’s romantic accents such as its silver-finished chandeliers, grey mohair banquettes, lilac & cream sconces and purple velvet curtains, breathe new life into the space, designed by Koffinier & Ku. Most of Brennan’s inspired creations can be sampled in the wine & cheese bar where he offers a $15 tasting flight, an $18 tasting menu featuring sweetbreads, foie gras and mushroom risotto, and a $21 Artisanal cheese and salume plate. Brennan has even gotten more playful in the dining room, encouraging his diners to create their own “do-it-yourself” tasting menus, further proof that Picholine’s not just for grown ups anymore. Just after Picholine’s reopening, I sat down with the busy chef to ask him all about the new look of his flagship restaurant. Q: How long had you been considering re-branding Picholine, and what was the deciding factor that prompted you to do it? A: I have been seriously considering renovating Picholine for three years. French restaurants were much different 13 years ago when I first opened Picholine, and my cuisine is now inspired by the flavors of southern France, Italy and Spain, rather than just regional French. I decided I needed to bridge the gap between the previous motif to the sensibilities of my modern Mediterranean cuisine. Q: What were your inspirations for the new menu, and what new concepts are you putting into play? A: Over the years, Picholine was beyond serving just regional French cuisine. Today, Picholine is inspired by the flavors of the Mediterranean such as Southern France, Italy and Spain. The new concepts I’ve implemented include the Cheese & Wine Bar at the front of the restaurant, which features Wine & Cheese Flights, Tasting Flights, Small Plates, and 40 wines by the glass - geared toward the pre- or post-performance diner or a guest looking for a quick, casually elegant late-night meal. 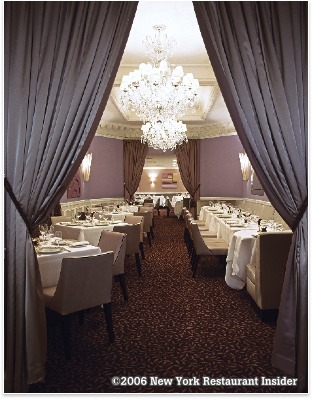 In the main dining room, the menu categories are redefined with titles such as “Preludes,” “Day Boat” and “The Land”. Any dish can be ordered as an appetizer, middle course or entrée. Guests can design their own tasting menus, and portion sizes will vary depending on the number of dishes ordered. Q: What was your vision for the new look of Picholine? What did you ask of designers Etienne Coffinier & Ed Ku? A: Having the opportunity to live and work in the South of France, I felt a connection with that region. Provence was an inspiration in terms of colors and flavors. Such colors that came to mind including hues of eggplant, lavender, and lilac. I also happen to like the color purple and Picholine’s logo has a purple olive, which was the starting point in terms of the color palette. Etienne Coffinier & Ed Ku introduced silvers and grays to the fabrics & textures, which I thought were terrific complements. Q: How is Picholine different than Artisanal? 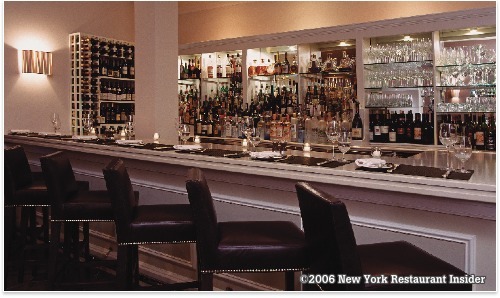 A: Picholine is more of a fine dining experience while Artisanal captures the spirit of a casual French brasserie. What connects the two restaurants is my love of cheese. 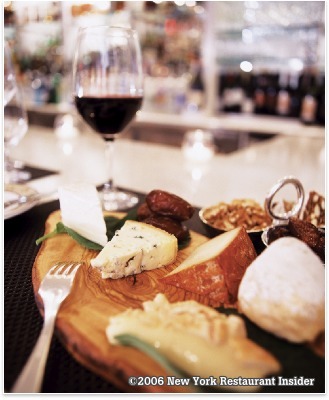 At Picholine, I introduced traditional European cheese service as part of standard fine dining in America. At Artisanal, I let cheese be a foundation onto which to build a restaurant upon. No other restaurant in America boasts a dedication or selection of cheeses like Picholine and Artisanal. Q: What are your favorite cheeses? A: Right now, I’m hot on any sheep’s milk cheeses, Vermont Shepard, Serra da Estrella, and Epoisse varietals. Q: What is your favorite new dish on the menu? A: The licorice-lacquered squab and sheep’s milk gnocchi with gulf shrimp, chanterelles, and parsley pistou. Q: Do you think that periodic ‘rebrandings’ are necessary and inevitable for a contemporary New York City chef to survive? A: I do not consider what I did as “rebranding” as much as “reinventing.” It is imperative to pay close attention to your restaurant and have the ability and flexibility to make appropriate changes to meet the needs of your customers as well as maintaining the quality and mission of the restaurant.